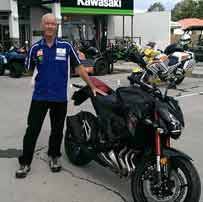 28/04/2017 - Stephen Middle Ridge Z800 Ultimate Suzuki Ipswich A very happy Stephen, taking delivery of his BRAND NEW Z800 from Ultimate Motorbikes Ipswich. Congratulation and enjoy the ride Stephen! 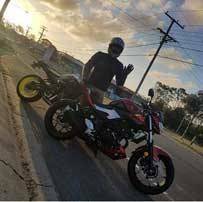 28/04/2017 - James & Janelle Upper Coomera MT-09 Tracer & New MT-09 Ultimate Yamaha Springwood. James and Janelle had their Q-Ride booked for the weekend so saw us here at Ultimate Motorbikes Springwood earlier in the indulging in Yamaha's sweet crossplane triple engine in different formats. Janelle got herself the brand new 2017 MT-09 naked and James decided on the MT-09 Tracer for dual sports and touring potential with both having an carbon full Akrapovic exhaust system fitted and trading in their previous bikes to us. We at Ultimate Springwood wish you many years of exciting riding together on your new rides! 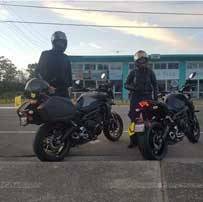 28/04/2017 - Kylee & Richard Coalfalls 2x Ninja 1000 Ultimate Suzuki Ipswich. 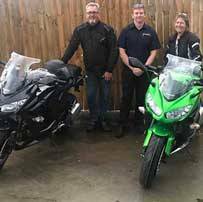 Here is Kylee & Richard picking up their two new Kawasaki Ninja 1000's from Ultimate Motorbikes Ipswich. They took full advantage of the huge savings on offer from Kawasaki this month and are currently waiting for Yoshimura Slip-on's. Congratulations guys and we will see you at your first service! 28/04/2017 - Robert Eagleby 2016 Yamaha MT-03 Ultimate Yamaha Springwood Robert picked up his brand new MT-03 from the team at Ultimate Springwood, and here he is literally about to ride off into the sunset! Congratulations Robert and enjoy!